How will you get to the other side? One month down, 11 to go. How’s it going so far? Are you on course to meet your goals or is it too early to say? If you’re not on course, or worse don’t know, then re-check that you have the right mechanisms in place to give you the information you need, when you need it. Veering off course can happen quickly and if January hasn’t started as planned and considering how quickly it’s come and gone, where exactly are you and where could you end up in a few short weeks. Imagine your goals are on the other side of a stream or small river in a specific spot on the bank. Getting to the other side isn’t a problem because the river is full of flat, secure stepping stones which are close together so you can take small, safe steps. You need to pick your path, as the stones are everywhere, and in a straight line you could get across in about 40 steps. Remember, your goals occupy only one spot on the river bank, so you need to get to the other side at exactly the right spot. What’s your tactic? Well, you might look up to check after each step you take or you might take a few steps then look up and correct your course if necessary. Either way, you’re unlikely to take many steps without stopping to check. Now, imagine, you are blindfolded and can lift the blindfold and check your position only after you have stepped over say half-a-dozen stones. It is likely that you will be off course somewhat but at least you can correct that course each time you look. Now imagine that someone else, who cannot see the other side, is telling you where to step. It is highly likely that this time, when you check, you will be even further off course. So, you inform the person of where you are so that corrections can be made and then take instructions once more. Eventually you’ll get to the other side but will you be at the right spot and how much longer has it taken when blindfolded or taking instructions from another? If your goals are annual and each stone represents say, a week, you must get to the other side in under 52 steps…would you even have made it? Clearly the most efficient and effective method is to not be blindfolded and to look up and check your progress every step or two. If each stone represents a week in your business then clearly you need up-to-date progress information, probably in the form of summary reports and short focused team meetings. To stay on course, you need to check your heading regularly and receive the information you need to be able to correct your course if necessary. 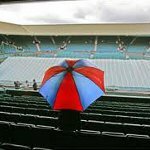 If that decision is based on the information being provided by others in your company then make sure you have a robust system that collects and delivers that information up the chain, to you at the helm. What mechanisms do you use for staying on course? If, like most companies you’re at the half-way point in the year, you’ll be checking your progress against your business plan. This month I have been focused on how to have effective quarterly review meetings in both this blog and my email messages because these up-and-coming quarterly review meetings will be particularly important. This is your last real opportunity to adapt your strategy plan and make any significant course corrections. As you prepare for your quarterly review meetings I’d like to make a suggestion. I’d like you to think about how to make this and future quarterly reviews as mutually benficial as possible. As the reviewer who gains more from the meetings, speak to the other party prior to the meeting and outline why you need the information. Explain that it isn’t just a data mining exercise and outline how the findings from the meetings will also benfit the reviewee. For example, explain that if a particular product isn’t selling well, then with the reviewee’s feedback as to the the challenges they’re experiencing, the reviewer’s company will discuss the problems and either improve the product, or the sales training or marketing messages or whatever else is needed, to help the reviewee meet future targets. As the reviewee, if there are topics you wish to raise then explain why and get them on the agenda prior to the meeting. Great leaders negotiate for mutually beneficial results and both sides need to be responsible for ensuring that these meetings achieve just that. Enter the meeting knowing why you’re all there and the mutual gains to be had. Work as valued partners on the same level and adopt the attitude that these are vital meetings that are worth every minute spent on them and which will help keep both companies on course. What do you think will help quarterly reviews be the productive, mutually beneficial meetings they should be? Invigorating boost or damp squib? Are your quarterly review meetings the strategic boost they should be or do you and your people simply leave the room and go on with business from where it was left off? You may have agreed some actions to catch-up on missed targets or to resolve some problems raised, but was the meeting and outcome worth the time and effort it took to prepare and attend? Add up the number of people involved in your quarterly review meetings, the time taken to prepare for and have the meetings. You’re potentially looking at man-weeks of time and effort. Even if you do everything you can to make the meetings effective in both their preparation and execution you still may not receive the information you need to make the necessary corrections to keep your business on course. This is because, peoples’ emotions and office politics can get in the way. People don’t always want to say what’s on their mind for fear of the consequences. If the meetings appear to go too well, with no challenging questions being asked, then this may well be the reason. Peoples’ careers are of course vitally important to them and not raising a problem because they don’t wish to rock the boat is both common and understandable. If you don’t get the answers you need, regardless of how tough they are to hear, then you may miss a vital issue that could grow into something that has a big impact on your business if not addressed. This is where bringing an external facilitator into these meetings can make all the difference. An objective outsider, who knows your industry, can quickly come up to speed on your strategic priorities and goals, speak with a selection of people in your company and ask the hard questions, or raise the issues in the meetings that others don’t want to. Because of their objectivity and experience, they may also ask questions that no-one else thinks of. Issues and ideas need to be raised and discussed. Review meetings need to be a boost to the company and the people who spend so many hours of the lives working in it. The return for having these meetings needs to be worth the time and effort invested. You cannot afford them to be damp squibs. Do you carry out quarterly reviews with your top customers? The quarterly review meeting is often seen, and usually for good reason, as a gruelling experience under a spotlight of questions. Why would a customer agree to such a thing? Firstly, these meetings don’t have to be like this and secondly, doing this will benefit their business as well as yours. I’m not talking about the traditional supplier/distributor trials but about effective meetings where each side can discuss their challenges and expectations and work together to achieve them. Say you’re a component distributor or contract manufacturer who was able to discuss with your key clients how many components they bought from you or how many units they contracted you to manufacture against how many they said they would? How much would you gain from knowing why the reality and forecast didn’t match, what the future expectations are and the challenges your client is experiencing, or needs to overcome, to meet their forecast? What would your customers gain? Do you have experience, resource or connections that could help a customer overcome a particular challenge? Could you offer a better contract in return for actual business being placed against an accurate forecast and a long-range plan that helps you better manage your stock or more efficiently manage your production runs? The offers you make and the benefits you paint are particular to your business, but the gains can make a massive difference on both sides. Another, huge benefit is that this is one way to get your key clients to see you as valued partners without whom their business would be less successful. Achieve this and you will strengthen the relationship, make life more difficult for your competitors and potentially see an increased return in customer value. Choose your top 5 or 10 clients and present the idea of having quarterly reviews and the potential benefits to you both. 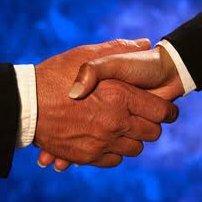 Forge closer ties and become valued strategic partners. Build your business on a strong foundation and eliminate hope, luck and uncertainty. 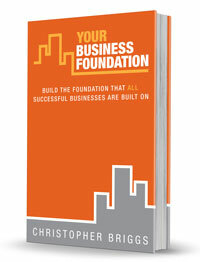 My name is Christopher Briggs, the author of the best selling book "Your Business Foundation". I help business owners build their business on a strong foundation that gives them the certainty and control they need to achieve their aims. Chris Gill, President & CEO, Silicon Valley Association of Start-up Entrepreneurs. Where Do You Want Your Business to be in 12 Months’ Time? Are You Selling Yourself Short? Are You Sending Your Prospects to Your Competitors? Copyright © Your Business Foundation 2014-2018. All rights reserved.